Mary Donald was baptised on 30 December 1801, in Lesmahagow, the daughter of Andrew Donald, a farmer, and Margaret Meikle who were married on 28 December 1786, in Lesmahagow. Mary seems to have been the seventh of twelve children. According to his later gravestone Andrew Donald was a farmer at Blackwood Yett, a farm just to the south of Blackwood, about 3 miles north of Lersmahaygow. 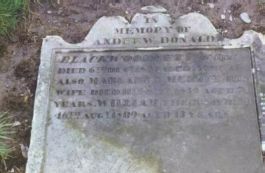 Mary Donald's father, Andrew Donald, died on 6 December 1822, aged 60, and her mother, Margaret Meikle, died on 11 October 1839, aged 74. They were both laid to rest in the graveyard of Lesmahagow church, alongside their son, William**, who died on 16 October 1809, aged 13, and these details are taken from their headstone there. Householder Forename Spouse Forename Address M F No. I would guess this maybe a misreading of DOUGALD for DONALD and BRAKENWOODYET for BLACKWOODYET, with 3 males and 4 females. Sight of the original would be good and would might also give more info on John Robb and Mary Thomson. According to the age given for Margaret Meikle on her gravestone of 74 she would have been born circa 1765. It is therefore possible that she was one and the same as the Margaret Meikle recorded in the I.G.I as born 13th October 1765 in Lesmahagow, the daughter of William Meikle and Janet Meikle.